With the competitive job market and scarcity of a well paying job, a lot of people are desperate to secure stable employment. Unfortunately, scam artists are taking advantage of the situation and coming up with ever more elaborate and convincing scams to dupe genuine, hardworking people. Stay-at-home jobs have been on the rise with the advent of the internet, and to be clear, there are many legitimate opportunities to make a living remotely. The problem, however, is that scammers have taken to telecommuting as a main focus of their cons because a lot of people either ignore or genuinely do not know how the industry works. There are a few common scams that you should be aware of, as well as tips to avoid these scams. Get paid to post ads on the internet including on Facebook, YouTube, blogs, and Craigslist. You will be provided with a read-made advertisement to post, usually for the company offering the job. The catch here is that you have to pay a one-time fee or create a paid account for the opportunity to make tons of money doing minimal work. What you are essentially doing is spamming social media sites and playing a part in recruiting more paid members to be scammed by the company. Needless to say, you will not make any money. Most of these websites are professionally designed and look completely legitimate and it can be hard to resist. The idea here is simply to get paid to shop. Visit a shop online or offline, buy products or service and evaluate the experience. The company reimburses you fully or partially for your expenses and pays you extra for your trouble. The con usually starts with getting an unsolicited email or other communication from a retail outlet or agency to become a secret shopper. The website can look very convincing and may even claim to work with well-known retailers such as Kmart and Wal-Mart. Once you agree to the terms of employment, the company sends you a check for $1,500 for example, with the instructions to deposit it into your account (under the pretense of activating your employment or another abstract idea), and keep part of the money as an advance payment. You will then be required to wire back the rest of the money or send to another account. The problem here is that the job is not real and the company has no real connection to any of the mentioned retailers. What’s worse, the check is fake, and you will be left to sort out the problem with the bank and in many cases the authorities as well. Make big money entering data into spreadsheets for big companies. Some companies falsely advertise their jobs as “non-traditional” data entry work, which is really affiliate marketing. 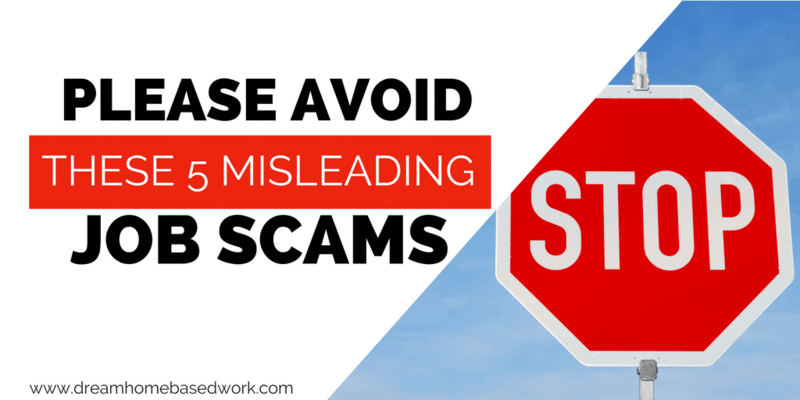 These scams will typically charge a fee for a list of employers or a paid training course. Other ways that these scammers get money is through administrative or test costs. Some scammers also administer tests just like legitimate jobs, but nearly everyone fails. You will then be required to pay a fee for a remedial training that will guarantee that you get the job. There are legitimate data entry jobs out there, but these do not pay nearly as much as the scammers will have you believe. Get paid anywhere between $1-$10 to stuff envelopes and send them out. You will be provided with everything you need for the job. All you literally have to do is put letters in envelopes. Apparently stuffing envelopes is not as simple as it first appears, so you will need to pay a fee for an envelope stuffing kit. In addition to this, you may be required to pay disclosure or processing fees. The truth is that you will not receive any special information or kit to turn envelope stuffing into a lucrative work-at-home opportunity. In many cases, however, you might get your “start up kit”. This is simply flyers in your mail that you are expected to mail out to other people. The flyers are of course advertising the scammer. You get a measly commission for every person that signs up. You would be lucky to get $5 for every $30 you make for the scammer. Start an online business with minimal capital selling anything from toilet paper to toothpaste. There is a lot of money in household goods so you have everything to gain by investing a little cash in this venture. You get approached to start an online business at a fraction of the cost of starting a real business. All you need to do is pay a one-time fee up front to get you started. This could range anywhere from a few hundred to a thousand dollars. Once you make this payment, a professional will build and host a business website where you offer household goods for sale. All you need to do is promote the business. Everything else including shipping products and stocking inventory is done for you. On your end, you simply collect a commission on every transaction. The truth here is once you pay the upfront fee, your communication with the benefactor ends immediately. This is not a real business and there is no way to track the con artist or get your money back. It is actually pretty easy to spot most online job scams if you know what to look for. There are some glaring signs that should outright let you know that you are dealing with as scam or at the very least, that you should tread carefully. This is especially the case if the job opportunity you are looking at comes from a big or well-known company. Use a search engine to find the official company website and compare the URL with what you have for your job listing. Watch out for additional characters in the URL such as “inc” or those ending with “.net.” In addition to this, compare the job listing you have with that on the company’s official website. If there are any discrepancies or the listing cannot be found on the official website, you are likely dealing with a fraud star. Watch out for people offering you work-from-home job opportunities that you did not apply for. Although people do get legitimate jobs based on their LinkedIn profiles or other professional profiles, it is worth doing a little more search about the company, especially if you have never heard of it before. Be especially vigilant with any company that gives you less than the normal two week’s notice to quit your current job. It is not completely unheard of for work-at-home interviews being conducted on chat. However, this is typically not the only form of communication. If you are only talking to a potential employer on instant message, it is worth digging deeper about the job offer. If you have any doubts, ask to communicate by phone as well as ensure that their web address is legitimate. Look out for subtle clues such as poor grammar and punctuation, and providing personal information that is typically prohibited by HR departments such as age. A glaring red flag that you might be dealing with a scammer is contact information cannot be verified. Some scammers create incredibly convincing business websites but with one little problem; little or no contact information. Verify any contact information provided independently if you have any doubts. To being with, you should never have to pay any kind of fee to work unless it's for a background check or credit check. The company will usually guarantee a job position before it even gets to that step. With that said, do not provide your banking information for any reason. This is a common way scammers get access to your account and withdraw funds or make unauthorized charges. There are still many legitimate telecommuting opportunities but it is important to remain vigilant. Scammers will do anything to make a quick buck but with the right information, you should be able to easily detect these scams. Check credible jobs-boards for legitimate telecommuting opportunities. As a parting shot, if a deal sounds too good to be true, it probably is. Any only job claiming to make you rich with little or no experience, skills or effort on your part is most likely a scam.